Santa's Holiday Discount PSD Wallpaper - Free Photoshop Brushes at Brusheezy! Let Santa tell the big news of your holiday sale with this new Santa's Holiday Discount PSD Wallpaper! This holiday discount PSD wallpaper is decorated with red bows and Christmas ornaments. You'll love the cute little Santa on this holiday PSD wallpaper! Rather have the vector version? 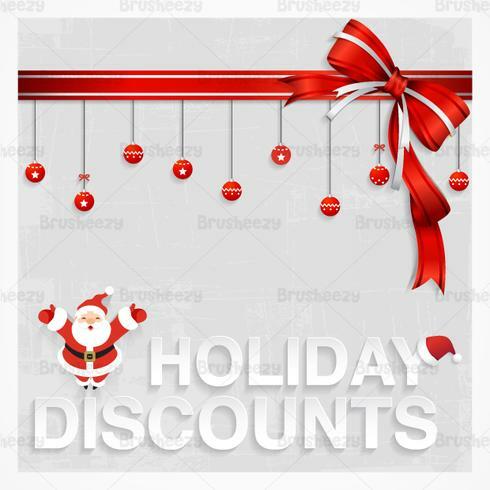 Download the <a href="http://www.vecteezy.com/holiday-seasonal/59517-santa-s-holiday-discount-vector-wallpaper/premium">Santa's Holiday Discount Vector</a> over on Vecteezy!